The Serengeti Bushtops is a 5-star accommodation situated in a prime location only 15 miles from the Mara River, in the northwestern sector of the Serengeti National Park. The camp offers abundant wildlife viewing year round, with the arrival The Great Migration in June and lasting through November. 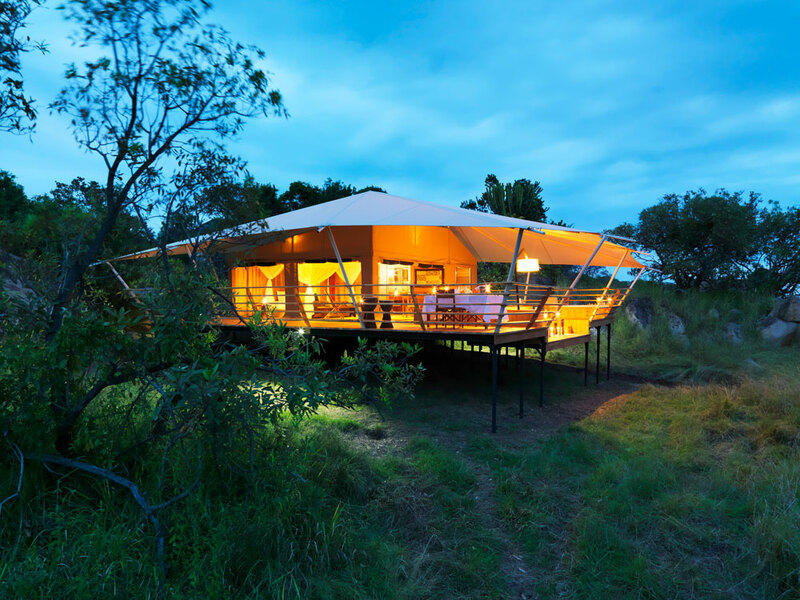 There are 12 spacious luxury tents and 1 family tent all facing the sun downer, each with wooden flooring, en-suite bathroom, hot tub, private veranda, writing desk, and contemporary furnishings. There is uninterrupted, round the clock power supply and a butler service. There is an elegant dining and lounge area with fireplace and bar, a library, and unique wine wall. Dining is on an la carte basis and meals can also be enjoyed in the privacy of the tent. A traditional camp fire is also located just outside the main lounge. The combination of superb food and drink, luxurious accommodation, and staff who are determined to match and exceed every expectation make this a truly special venue.